Meaning basket, Cestino weaving is a design staple in Italy from hand bags to ceramic tile and tapestry to breads. The Cestino (basketweave) large knobs will add a sense of Italian country charm to your cabinet or furniture. Available finishes include Antique Brass, Antique Copper, Antique Gold, Antique Nickel, Antique Silver, Gunmetal, Oil-Rubbed Bronze, Polished Gold, Polished Nickel, Polished Silver, Satin Nickel and Vintage Pewter. Mounting hardware is included. 100% lead free pewter. Handcrafted in the USA. Meaning basket, cestino weaving is a design staple in Italy from hand bags to ceramic tile and tapestry to breads. The Cestino (basketweave) round leather knobs will add a sense of Italian country charm to your cabinet or furniture. Leather choice includes black or brown. Available finishes include Antique Brass, Antique Copper, Antique Gold, Antique Nickel, Antique Silver, Gunmetal, Oil-Rubbed Bronze, Polished Gold, Polished Nickel, Polished Silver, Satin Nickel and Vintage Pewter. Mounting hardware is included. 100% lead free pewter. Handcrafted in the USA. Meaning basket, cestino weaving is a design staple in Italy from hand bags to ceramic tile and tapestry to breads. 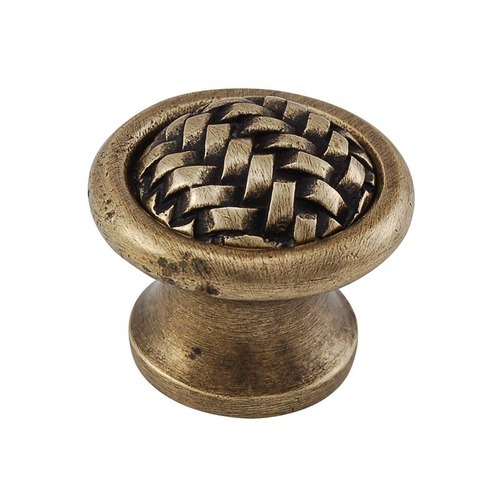 The Cestino (basketweave) leather knobs will add a sense of Italian country charm to your cabinet or furniture. Leather choice includes black or brown. Available finishes include Antique Brass, Antique Copper, Antique Gold, Antique Nickel, Antique Silver, Gunmetal, Oil-Rubbed Bronze, Polished Gold, Polished Nickel, Polished Silver, Satin Nickel and Vintage Pewter. Mounting hardware is included. 100% lead free pewter. Handcrafted in the USA.